A 2011 Mustang MPG Record ! How to kick off the introduction of a new fuel efficient V6? How about a 2011 Mustang MPG record. 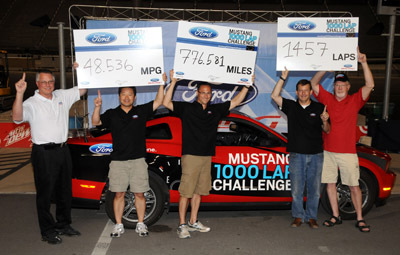 The folks at Ford wanted to prove just how fuel efficient the new 3.7 liter V6 powered 2011 Ford Mustang really was. And they chose Bristol Speedway as the place to prove it. 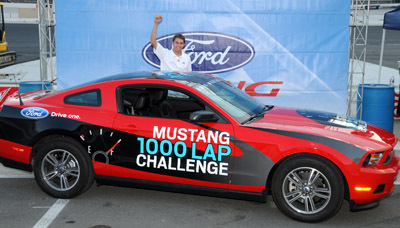 Their goal was to see the new 2011 Mustang complete 1000 laps of the race track on a single tank of gas. The .533 mile track length, meant that the new Mustang would have to make more than 500 miles on it's 16 gallon fuel tank. However, at it's EPA highway rating of 31 mpg, the Mustang should have been able to make 496 miles, falling short of the 1000 lap challenge. a team of drivers, who would be changed at 1 hour intervals, were trained in fuel saving techniques. A Fuel Efficient Finish ! After 17 hours and 40 minutes, the Mustang's MPG Record Run ended in dramatic success. This new Mustang V6 carried its drivers for a total of 776.5 miles on a single tank of fuel. The result was the recorded fuel economy, showing an amazing 48.5 MPG.